The NHL is great. I never realized it before, but hockey is great and the games are fun to watch. Because the sport is not something that most people in America play growing up, the sport is very much less popular than basketball. However, you can see with attendance numbers that people enjoy going to NHL games just about as much as they do to NBA games. Now Twitter is pretty terrible. At any given time the trending topics are awful. If a topic is trending it means that a majority of people are talking about those items. In the DC area specifically, in the case of sporting events, or big national news, these topics actually tell you what people are focused on in the area. When nothing is happening then a movie on BET will be trending, or something stupid like #whosyourbabymomma and #thingswhitepeoplesay. But if something happens like Tim Tebow leads a comeback or a dictator dies, those will pop right up. Every single one of those is either an NBA player, coach, or team. There is no Christmas trending. There are no stupid hashtag trends like #whatifjesuswasindian which had been earlier in the day. All NBA. And the local team the Washington Wizards aren't even playing. That got me thinking. 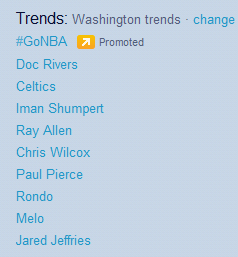 Would there ever be a day in DC when the entire trending topic list would be the Caps or the NHL? Definitely not in the regular season, even if it was opening day on Christmas. I'm skeptical that even if the Caps were playing a Stanley Cup game on a night where there were no other sporting events that they would get all the TTs in this area. I was thinking maybe the Winter Classic. But I think that there are College Bowl games that conflict with that game, so probably not.